It’s easy to think of the independent female voice as a 20/21st century phenomenon. Helen Edmundson’s The Heresy of Love is a reminder – as would a play about the 12th century mystic and composer, Hildegard of Bingen – that women of independent spirit have existed for a long, long time. Edmundson, a frequent adaptor of novels for the long-established and admired ensemble, Shared Experience (Anna Karenina, The Mill on the Floss, War and Peace) has here written a drama that both fascinates in its introduction to a little known character to us (though revered now in Mexico) and grips as an exploration of the conflict between religious faith and self-expression that has huge resonances for today. Edmundson writes carefully, with a sensitive awareness both of history and its contemporary application and significance but with a Shakespearean sense of breadth and depth. Indeed, it was the RSC who originally commissioned the play and staged it three years ago in Stratford at the Swan Theatre. 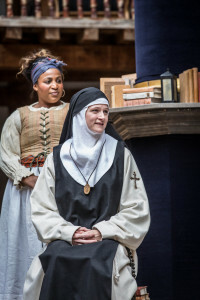 It tells of the real life of 17th century Mexican nun, Juana Inés de Asbaje, a prolific writer of plays and poetry who fell foul of the Spanish dominated Catholic Church hierarchy and died of the plague, with a story clearly thoroughly researched for authentic detail but undeniably touched by contemporary sensibility. As Juana’s denunciations ring out and her assertion of a woman’s right to speak reaches its climax in her exchanges with the rigidly orthodox, Inquisition influenced Archbishop Aguiar y Sejas, her criticisms are couched in familiar, recognisably modern psycho-therapeutic terms such as the Archbishop’s possible fear of women and suppression of his own desires translated into the harshest repression. But Edmundson also makes us see Juana’s almost foolhardy self-regard in her brave and proud assertion that faith should lead to greater knowledge and expansion. In submitting to the rules of her faith and convent, she argues, she did not renounce her MIND. By contrast, for the Archbishop, such claims can only reek of selfishness, the road to God and salvation being through self-abnegation, not self-proclamation. Nicely balanced as they are, alongside these theological arguments, Edmundson also injects subsidiary storylines of personal envy, jealousy, ambition, Spanish-Mexican cultural relations and thwarted sexual desires making for the richest of dramatic tapestries, one that seems to expand even more fully in the Globe’s open-aired atmosphere under John Dove’s direction that enhances and underlines without ever becoming raucous. Composer William Lyons provides a sensuous creation of western 17th century music adapted to a central American setting and the acting, from Naomi Frederick as Juana, Anthony Howell (some may recognise him from ITV’s Foyle’s War as Michael Kitchen’s patient police sidekick) as the seemingly sympathetic but scheming local bishop, Santa Cruz are uniformly excellent, three-dimensional and persuasive – none more so than Sophia Nomvete’s Juanita. Nomvete makes this comparatively small part of Juana’s servant and nurse to her young niece, Angelica, the anchor and lynch-pin of the production – earthy, ribald where necessary and utterly dependable in a maelstrom of turmoils, emotional, political and social. 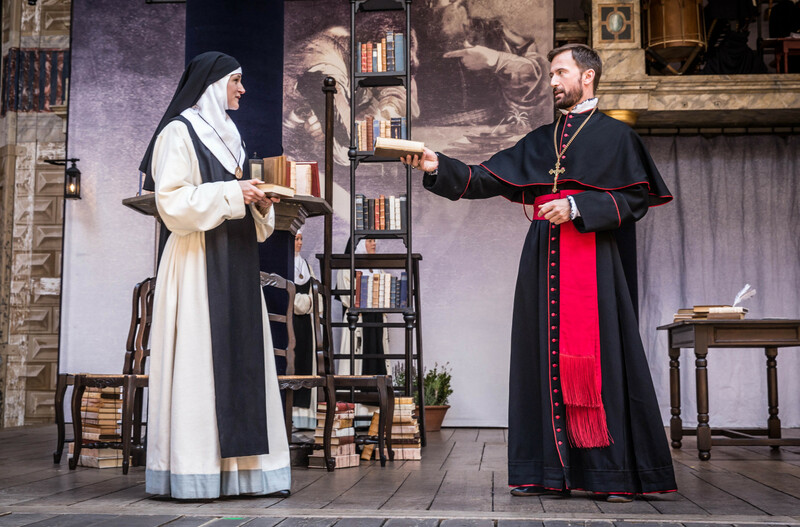 Sadly only around for another few performances, hopefully The Heresy of Love will live to fight another day. I can’t, however, imagine it being bettered. Fine, very fine indeed and another open-stage triumph to add to the other non-Shakespearean and new plays Dominic Dromgoole introduced during his time as artistic director at the Globe. Next year, a new director, Emma Rice, Kneehigh’s inspirational director takes over. Dromgoole leaves behind a fantastic legacy. 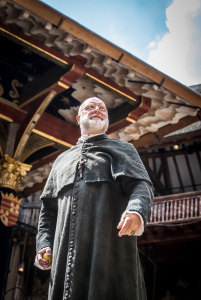 This entry was posted in 2015, Reviews and tagged Anthony Howell, Helen Edmundson, John Dove, Naomi Frederick, religious faith versus freedom of expression, Shakespeares Globe on September 1, 2015 by Carole Woddis.